Microwave oven usually is used to defrost frozen food, warm and cook food quickly. Microwave suitable for people who are busy and need to cook in practical way. Microwave oven was invented by Dr. Percy Spencer in 1945 when he and his colleagues investigated microwave for radar. Chocolate in his pocket was melted when exposed to microwaves. 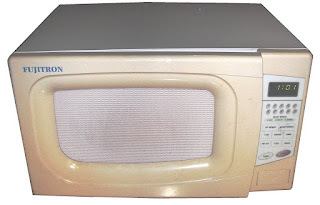 Microwave oven works by emitting radio waves with a frequency range 2450 MHz or 12.24 cm wavelength. These radio waves will cause water molecules in food to vibrate, the movement or vibration of water molecules causes heat, raise the water temperature inside the food and heat the food. The process of cooking with microwave did not heat the food container and the air around the food, any temperature rise on food containers and the surounding air is solely because of heat transfer from food to containers and from food into the air around it. Food is turned on a turntable while getting exposure to microwaves. Adjustment can be made by setting the time and level of microwave energy. Microwave requires considerable high electricity, requires about 600 watts to 1200 watts. But because shorter cooking time, microwave is quite economical if it is used correctly.